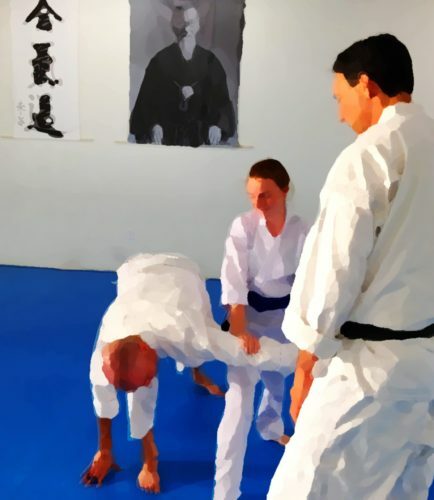 This is an image that came to me in my work during the Evolutionary Aikido seminar this weekend with Patrick Cassidy Sensei and Dave Goldberg Sensei. If I could draw or paint, and had the time, this post would be a hand-drawn, sketchy animation. Maybe just a sequence of still drawings, one dissolving into the next. Since that would take me months, and the results would be poor at best, I’ll give you the storyboard in words instead. Scene: We are inside a big, closed room. We see a person in the room. There are some things in the room – a table, a chair, a bookcase, a phone, a television, dishes, a bed… Simple things for living. Action: Our person is sitting, studying, working, exercising, eating. Living life, in their room. Scene: The things, or the person’s orientation in the room, make it impossible for them to see that there are doors, but we can see the doors. Or maybe there a faint outlines – maybe a lot of them – but our person doesn’t notice them. Doors to other rooms? Doors to outside? Doors to who-knows-where… Unseen, unnoticed, unopened doors. Action: Our person continues living in the room. We see signs of aging. Every so often someone outside the room opens a door a little, letting in a stream of of brilliant, warm light. We can see color and space through the open door. We hear something, maybe birds or voices. Maybe our person notices, maybe they don’t. Maybe they make a huge effort at sliding the bookcase to cover the open door, and go back to sitting, arms crossed, their back to the door. Again someone outside comes along, this time flinging a door open wide, revealing a colorful, expansive scene, with nature, people dancing, lying on the grass. We hear indistinct happy conversation, and music. Our person goes to the door. Looks out, looks back, and looks out again. Maybe some people outside beckon. The colors are beautiful. There’s so much space. There’s singing in the distance. Our person steps cautiously out of their room. They nearly trip over a flower, and stoop to see what it is. Scene: We pull back to see more of this space. Action: Our person takes in their new surroundings, picks up energy, tries a little dance. They see a closed door near the open one they just came through, go to it, and open it a crack. Through the crack we see two people sitting in their black and white room, watching a television. They turn, looking startled, to see the open door. Our person trots off toward a group of others, tentatively at first, then remembering how to move freely. Scene: The view pulls back slowly and continuously to reveal a long wall, with many more closed doors, and some open ones. Action: A few people are peeking through their cracked doors. A few doors have been carefully boarded shut. Some people are standing and looking out through wide open doors, wondering if they should step through. Some are living in their rooms, with open doors, ignoring the doors. Perhaps some are cowering under their covers. Others are out in the much larger, open, brilliantly colorful world, dancing, flying, exploring, playing, together. There is laughter and music and birds. Scene: We pull back to show that the wall is endless, and that there are more endless walls, with doors. Pull back to show the whole planet, spinning in space.